What are you and your family going to do after a collapse of society when there are no doctors and medications available, and the pharmacies and hospitals have been looted? You can prepare for every disaster scenario, but if you are not able to treat medical emergencies and injuries that arise, how long will you last? This book will teach you everything you need to know to keep you and your loved ones healthy. Dr. La Guardia has spent over thirty years researching ways to treat any and all medical conditions with non-prescription, over the counter and everyday products, many of which will amaze you. This book is jam packed with useful information in an easy to read format, chock full of illustrations and overflowing with information that could very well save your life. Dr. Ralph La Guardia has been in private practice in Connecticut for over 25 years. He is triple-specialized in Internal Medicine, Bariatrics and Geriatrics. In addition, he practices Integrative Medicine, which is the combination of the best of traditional western medicine with alternative and complementary medical techniques. He has a special interest in nutrition, sustainable gardening, and permaculture, which he practices on his farm in Connecticut. Dr. La Guardia also has a strong interest in minerals, trace elements, amino acids and their medical applications. Dr. La Guardia’s other passion is survival medicine. Most survival medicine books are nothing more than advanced first aid manuals, loaded with impractical advice. The Doomsday Book of Medicine was written to fill this void. As a life-long post-apocalyptic prepper and a private practice doctor specializing in Internal Medicine, Bariatrics and Geriatrics, it is only natural that Dr. La Guardia would exhibit an impassioned interest in alternative medical theories and effective natural remedies for treating symptoms and curing disease. Dr. La Guardia is also an avid gardener, building an orchard at his Connecticut farm where he grows everything from apples to blueberries. Naturally, his scientific curiosity and his passion for holistic medicine, natural healing and sustainability have led him to study the art of Permaculture and organic gardening practices. 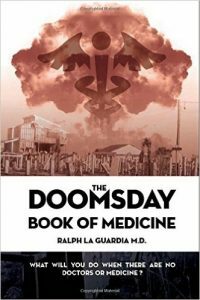 The Doomsday Book of Medicine is not your every-day first aid guidebook, medical desk reference or book of remedies. Rather, it is a comprehensive emergency preparedness and survival guide with more than 900 pages of important health-related information that is not only easy to read but also easy to understand. The book is divided into five main sections, each sub-divided into chapters containing related topics as noted in the main Table of Contents. At the beginning of each chapter, there is also another Table of Contents detailing the chapter’s sub-titled segments making navigation a breeze. The best way to stay alive and well in the event of an emergency, natural disaster or some other apocalyptic event is to be in good health. In Part One: The Basics You Need to Know, Dr. La Guardia goes to great lengths to discuss many aspects of hygiene, nutrition and preventative care, and the positive effect that it has on maintaining a healthy lifestyle. The first chapter covers the effect that personal hygiene, sleep, and exercise have on your health before moving on to an extensive discussion about the building blocks of good nutrition, including many immune system boosters for preventing illness before it ever has a chance to take hold. The next few chapters are centered around nutrition from the ground up… First with a chapter focussed on the impact of growing food in healthy soil can have on the body, important minerals and other nutrients that the body needs. Chapter three is comprised of twelve related sections focussing on vitamins and how they affect our nutrition. Finally, chapter four opens up the conversation to include seed oils and their health benefits. Chapter five brings Part One to an end with a series of lessons on fermentation and the long-term storage of foods including leavening of bread, pickling and even making yogurt. Section two is entitled Part Two: Some Essential Tools which covers chapters 6-12, each of which provides a ton of information on what symptoms common household products like Baking Soda (Sodium Bicarbonate), DMSO (Dimethyl Sulfoxide), Epsom Salt, Alkaline Water and Minerals, Honey, Potassium Iodide, Vinegar, Wood Ash, Lye, Soap and Activated Charcoal can relieve and what ailments they can cure. Each of them is crucial to have on hand in the event of an emergency situation due to their significant medicinal properties. The next section is Part Three: What’s Your Problem? which encompasses the bulk of the book, from chapter 13, all the way through chapter 39 totaling 475 pages. Some chapters are related to symptoms, while others are related to specific illnesses. But each is well covered by Dr. La Guardia from cause to cure, including many of the notable holistic and herbal remedies if any are available. The fourth section of the book is called Part Four: Odds and Ends. It contains one chapter on useful electronic medical devices designed for various forms of electrotherapy including Scenar and Tens units, then moves on to talk about Tennant Biomodulators. Chapter 41 is devoted entirely to sterilization. It discusses many of the different methods of sterilization from boiling and hot soapy water to various forms of chemical sterilization. Section five is the last major section in the book is called Part Five: Your Survival Medicine Chest. It is a list in an alphabetical order that Dr. La Guardia thinks should be included in every survival medicine chest. The final section of the book is the Bibliography and Suggested Reading List. It contains the entire collection of resources used to develop this book. Look there if you would like to explore any of the topics found in the book further. There are many books on the market that focus specifically on wilderness survival, and even various first aid and trauma -related topics. But most do not provide many real-world solutions for situations where emergency medical services and pharmacies will not be available. The Doomsday Book of Medicine addresses that shortcoming. It is a massive 900-page medical reference and collection of emergency preparedness and survival solutions.